Railpictures.ca - A.W.Mooney Photo: Here is another one of those long-forgotten rural stations that so used to dot the Ontario landscape. This is the former CP station at Bruce,a couple of miles up from Bruce Mines off Trans-Canada Hwy 17. Many years ago a small community sprung up here due to it being a junction of the CP and the Lake Huron & Northern Ontario Rwy. A line ran north about 15 miles to Rock Lake, where there was a busy copper mine operation. That is all gone now, everything quiet, and you can see in this photo taken 41 years ago tomorrow as I post this, that the station is not being demolished, but dismantled. I wonder where most of it ended up? | Railpictures.ca – Canadian Railway Photography – photographie ferroviaire Canadienne. 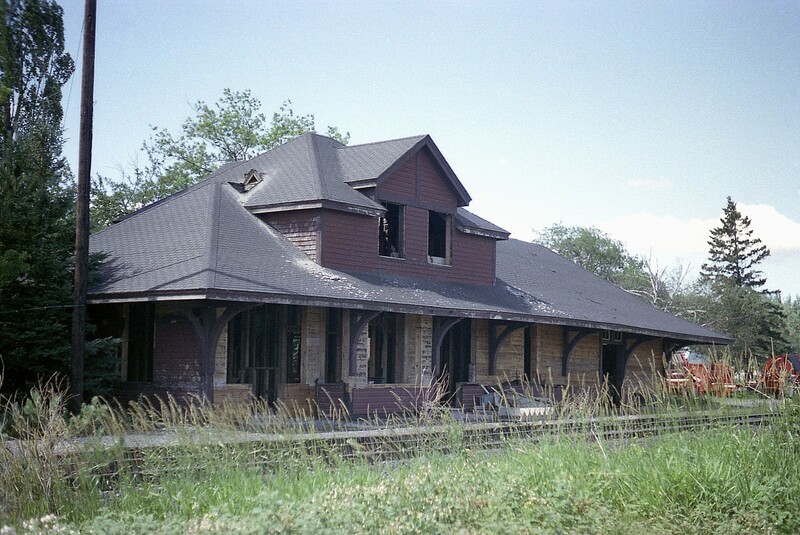 Caption: Here is another one of those long-forgotten rural stations that so used to dot the Ontario landscape. This is the former CP station at Bruce,a couple of miles up from Bruce Mines off Trans-Canada Hwy 17. Many years ago a small community sprung up here due to it being a junction of the CP and the Lake Huron & Northern Ontario Rwy. A line ran north about 15 miles to Rock Lake, where there was a busy copper mine operation. That is all gone now, everything quiet, and you can see in this photo taken 41 years ago tomorrow as I post this, that the station is not being demolished, but dismantled. I wonder where most of it ended up?